It has been said that ranchers and farmers are the original environmentalists. They are directly and forcefully affected every day by their natural environment. Typically, the first thing they do when they step outside early in the morning is to look for sign of a rain cloud. Rainfall or the lack of it, the weather cold or hot, the availability of water are concerns with which they must deal day by day, year by year. To whatever extent technology has allowed, they have tried to influence their environment to their benefit. Some of the results have been favorable. Others have fallen victim to the unwritten law of unintended consequences, trading one set of problems for another. A pristine environment prevailed for the first Texas ranches that began in the late 1600s and early 1700s with Spanish land grants along the Rio Grande. These were stocked by herds from Mexico, where a vast cattle empire already flourished. Like the Indians who had been there first, those Texas rancheros had to accept the land as they found it, for they could do little to enhance it. Their cattle watered at the river or from whatever creeks and springs nature had provided. Livestock survived or languished on the native vegetation, for it was technically impossible to provide supplemental feed in any significant way. Stock raising expanded as pioneering padres established Catholic missions to the north. Each mission had herds and flocks intended to feed priests and Indian converts. Early Spanish settlements north of the Rio Grande included San Antonio de Bexar, La Bahía (later, better known as Goliad) and Nacogdoches. Herds began to increase around these. Pressure from hostile Indians forced abandonment of many early land grants. As harried owners and workers retreated south of the Rio Grande, they left cattle behind. In addition, animals straying from loosely tended mission herds added to the numbers propagating in the wild. Few people felt a strong incentive to gather or control them, for they were difficult to handle and had little monetary value. For a time, ranching came to be dominated by the missions. Where private operators managed to survive, they followed in general the old Spanish mesta regulatory system, which set standards aimed at establishing individual owners’ rights and obligations and minimizing territorial disputes. Many ranching customs taken for granted today had their origins in Spain, including branding and ear-marking to denote ownership. Texas ranching derived many of its working procedures from Spanish and Mexican cattle-handling methods. Even much of the ranching vocabulary has been handed down from Spanish, though many of the terms have been Anglicized almost beyond recognition. La reata became lariat. Chaparejos became chaps. The word remuda still denotes a band of horses. The Spanish term vaquero became buckaroo in English. Ranching vocabulary evolved from the Spanish, such as the word 'chaps,' which came from 'chaparejos.' File photo. Legal American immigration into Texas began with Stephen F. Austin’s Old Three Hundred in 1821, though illegal immigrants had imposed an elusive American presence on the eastern Texas redlands many years earlier. The first Anglo settlers brought with them small herds of English-type cattle, primarily from the southeastern states. These began mixing with the abundant Spanish stock already here. For the most part, early American Texans were farmers to whom cattle were a secondary consideration. They were slow to take hold of the Spanish-Mexican concept of ranching on a large scale. Most saw the undeveloped native environment as an obstacle to be conquered. They agreed with Austin’s declaration that nature was not to be accepted as it was but tamed for the benefit of man. Like their European forebears, they set about to change it by plowing up the land and hacking away at the forests and dense thickets so prevalent in eastern Texas at the time. A clean field and a cleared forest were seen as signs of a progressive civilization. In Mexican colonial Texas, the ten years of the Republic, and the early years of statehood, wild cattle were so plentiful that beef had but little value. If a settler wanted meat, he could venture out and kill an unbranded Longhorn. A cattle owner found little outside market because Texas was too far from Eastern states where there might have been a demand. The only paying market for cattle was along the Gulf Coast. There, they were slaughtered for their hides and tallow to be shipped by boat to the Eastern seaboard. Most of the meat went to waste. By the 1850s, some limited trail driving had begun, moving cattle afoot to such markets as New Orleans, St. Louis and, in at least one recorded instance, all the way to New York. Though these early experiments had but small economic impact on the state, they set the stage and trained cadres for the legendary drives that would begin after the Civil War. They demonstrated that it was feasible to push sizeable herds for long distances while they lived off of the land through which they passed. The war and Union blockades along the Mississippi stopped most of this traffic, though Texans continued to drive cattle as far as New Orleans to help supply Confederate troops. During the war years, the numbers of unbranded cattle running free in the southern part of the state mushroomed because of neglect. Many working-age men went into Confederate military service, leaving home, ranches and stock farms tended poorly, if at all. The state suffered little physical damage during the war. Union troops barely touched Texas soil except on a bit of the Gulf Coast and along the Rio Grande from its mouth up to about Laredo. However, when the guns fell silent, the state was financially drained. Cotton was its only major cash crop capable of finding an outside market and bringing in hard currency. That was not enough. The surplus of near-worthless free-roaming cattle took on a new significance. Demand for beef was strong in the North and East. Intrepid cattlemen, remembering the pre-war drives to distant markets, realized that animals worth no more than a dollar or two on their home range might fetch twenty dollars if they could be delivered to a suitable market. Jobless men home from the war were happy to become drovers at a dollar a day or less. The cattle could subsist on grass along the way and, if handled properly, might even gain weight on the trail. Early drives took Texas cattle to Sedalia, Missouri. As railroads pushed westward, drovers switched destinations to such Kansas towns as Newton, Ellsworth, Abilene and Dodge City, each in its own turn. A typical trail herd numbered from 1,000 to 2,000 or 2,500 head, handled by ten to a dozen cowboys, along with a horse wrangler, wagon cook and perhaps a cook’s helper. Drives began with rising of the grass in the spring, typically took two to three months and ended late in the fall. Usually the best prices were paid early in the season, so there was a rush to be among the first arrivals at the shipping points. Those drovers who came late in the fall usually found the market tired and oversupplied. Moreover, the early herds had the best grass. As each season wore on, plodding hooves left the original trail badly beaten out. Drovers moved their herds to one side or the other, seeking fresh grass. By fall, the hard-used trail was far wider than before. This deepening scar was considered to be of little importance. It was taken for granted that it would heal by next year in time for resumption of the drives. Anyway, there was still lots of land. Though it eventually became common to speak of “old trail drivers” because later generations knew them as aging men, most of the drovers were young. Many were little more than boys, their first time away from home. It was not unusual for a trail boss to be no more than 21 or 22 years old. As has been said of war, trail driving consisted of long periods of boredom punctuated by occasional moments of sheer terror. Though stampedes and Indian attacks have been the subject of much trail-drive fiction, far and away the greatest hazard was river crossings. The average cowboy could not swim. Many a grave was dug on the banks of a swollen river. The trail drives helped establish cattle raising as a viable business in Texas by giving the animals a real value. Ranching boomed for a few years. From its beginnings in South Texas with such large operations as the King Ranch, it spread northward into Central and North Texas and eventually into the Panhandle in the wake of the great buffalo slaughter and Indian removal that freed up hundreds of thousands of acres of grazing land. Millions of dollars of European capital flowed into Texas in the quest for the “beef bonanza.” Texas cow herds were drifted north into the mountain states to establish ranches on old Indian hunting grounds. Money flowed freely, for a time. And if grass was getting short on the heavily stocked ranges, few felt any great concern. A good rain would bring it back, most believed. Reality came like a clap of thunder, bursting the speculative bubble. Overgrazing and droughts took a toll on the grass. Severe blizzards of the mid to late 1880s caused catastrophic death losses that staggered cattlemen large and small. A major break in cattle prices added to the financial misery, triggering bankruptcies that reverberated all the way to the counting rooms of New York, England and Scotland. Those cattlemen who survived became better businessmen and, as a class, more careful, methodical operators. As small settlers took up more and more land that had been regarded as free range, ranchmen began seeing the need to own the land on which their cattle grazed. They started fencing their property with barbed wire to keep their animals in and others out. By isolating their herds, they were able to take advantage of better bulls and upgrade their native Longhorns. They imported such European breeds as Herefords, Shorthorns and Aberdeen-Angus to produce meatier if less hardy offspring. Opposition to barbed-wire fences spurred violence in some areas, but free-range advocates lost out to changing times and passage of strict Texas fencing laws. As an industry, ranching never stood still for long. It was in a constant state of change, adapting to new technology as it appeared. Along with fencing came drilling of wells and erection of windmills to produce water from underground where it did not exist on the surface. This allowed grazing of ranges once regarded as useless because they were too far from water. Once ranchers had fenced their perimeters, they began cross-fencing into smaller pastures more easily managed with less labor. This made it easier to breed cattle selectively, mating the best bulls with the best cows for quicker progress. This progress created problems, however. Fencing led to herd concentration and yearlong grazing, which in turn led to deterioration of the range at a rate so gradual that it went largely unnoticed at the time. Most early ranchers had come from elsewhere, usually areas accustomed to greater rainfall. Basing decisions on their previous experience, they tended to overestimate the land’s carrying capacity and concentrate more livestock on it than it could safely accommodate, especially in dry country west of the 98th meridian. Buffalo, the previous dominant grazers, had moved freely across the open range, migrating by seasons. Though in their great numbers they might graze off the grass and trample the ground into powder, they moved on and left the land to rest and recover for months, even years, before they returned. Domestic cattle, by contrast, were confined to a limited space. A cow might live out a long lifetime without moving more than a few miles from where she was born. The long-range result was loss of the more productive forage and an increase in less desirable grass species and weeds. Invasive woody plants such as mesquite, cedar and whitebrush took hold where there had been little or none before. An aerial photograph taken some 60 years ago plainly showed the old Chisholm Trail, a line of mesquite brush marking the path the South Texas cattle had followed, scattering seed in their droppings as they moved along. Away from the trail the land remained relatively free of brush. A photograph made there today would show brush covering the entire range. It would be difficult to discern the trail, for the land is all heavily infested. A Midland-area rancher recalled that when he was a boy early in the 20th century, most of the Midland range was open grassland. Wood was scarce. He recalled chuckwagon cooks traveling miles out of their way to find wood for their fires. In recent decades, millions of dollars have been spent in the same area in an effort to control mesquite. Various forms of cactus, particularly prickly pear, also spread as a result of constant grazing. Untold amounts of money have been invested in seeking efficient chemical and mechanical methods of fighting this invasion at an affordable cost. In past years, conservationists spoke hopefully of eventual brush eradication. Today the best they hope for is a measure of control. Conservationists may argue about the various methods of meeting the problem, but it is generally agreed that heavy brush infestation has come at a sizeable cost to the state’s water supply. Mesquite, cedar and other such invading plants are of little or no economic value but consume horrendous amounts of water, as well as displacing the original vegetation. They reduce or eliminate water flow into creeks and rivers. They dry up springs and seeps that formerly ran the year around. The water-improving benefit of brush elimination was demonstrated some thirty years ago on Rocky Creek, northwest of San Angelo. Historically Rocky had flowed constantly until the 1920s, when it gradually ceased except after a rain. Old-timers agreed that this decrease in flow was accompanied by a large increase in brush infestation over the watershed. Ranchers along the creek joined hands in an ambitious brush-clearing project. With the brush removed, old springs and seeps once again came to life. Rocky Creek began flowing the year around. It still does, though gradual brush reinfestation has again reduced the flow, proving the old-timers’ point. Brush control for water enhancement is part of the long-range Texas statewide water plan, though the state has done little of it so far. Ranching has always been financially hazardous. Cattle prices have long been cyclical, each high point followed by a sharp slide, then a painfully slow climb back from the bottom. These movements have almost always reflected overall cattle numbers. When they are low, prices move up. When cattle raisers respond to higher prices by increasing their herds, prices break and cause a sell-off that further escalates the downtrend. Though at this writing cattle prices are at an all-time high, they have not been there long, and history indicates that present levels will not long endure. One of the industry’s most destructive downturns came in the fall of 1973, when prices plunged precipitously. Over the next three decades, many ranches that had been in family hands for several generations slid into bankruptcy. Cattle ranching — and sheep and goat ranching along with it — went through one of the longest periods of economic stress its participants could remember. Though predatory animals have been of relatively minor importance to the cattle industry, coyotes will sometimes take down small calves and even attack a cow or heifer while she is giving birth. Predators have had a far greater impact on sheep and goat ranching, to a point that they have driven hundreds of operators out of that business and have caused major shrinkage in the outside perimeter of the sheep-and-goat producing area. Political pressures by animal-rights groups have made it increasingly difficult for stockmen to protect themselves against these predators. The Texas livestock industry has experienced one great boon in recent times: eradication of the screwworm. This pest, spread by a specific type of blowfly, caused hundreds of thousands of livestock deaths each year and an incalculable toll on wildlife. Through the efforts of agricultural scientists, a method was developed to control them by sterilizing laboratory-raised screwworm flies in the pupae stage through exposure to nuclear radiation, then distributing them in numbers that overwhelmed the native population. Ranchers accustomed to the old-fashioned way of neutering animals were highly skeptical about doing it to millions upon millions of flies. Despite their doubts, enough of them voluntarily took a gamble on this far-fetched proposition to raise funds for a pilot project that proved the process workable. Texas is screwworm-free for the first time ever. The screwworm was gradually eradicated from Mexico, and a constant barrier is maintained at the Isthmus of Tehuantepec to prevent its return. Beyond its positive effect on the livestock industry, the elimination of the screwworm caused a boom in wildlife numbers. A high percentage of the Texas fawn crop each year used to die of screwworm infestation. Survival rates have skyrocketed in recent years, at times leading to a serious overpopulation and occasional die-offs through starvation. Economic necessity has brought many changes to the livestock industry as ranchers have sought ways to supplement their lagging livestock income. A major development has been an increasing emphasis on recreation, especially hunting. Though landowners in the Hill Country had sold hunting leases for many years, ranchers in most other parts of the state took their wildlife for granted. They did not recognize it as an economic resource. Because of landowner efforts and screwworm eradication, deer are more numerous today over much of the state than when the Indians held the land. On many ranches, particularly in the Hill Country and South Texas, income from hunting of deer, turkey, quail and other wildlife exceeds the income from livestock. Ranchers have catered to hunters by providing special amenities, even to the point of building permanent hunting camps and landing strips, allowing their guests to rough it in comfort. Here and there, some ranchers have abandoned their cattle, sheep and goat operations and devoted all their attention to enhancing their wildlife and hunting potential. Because Texas hunting seasons restrict native whitetail and blacktail deer harvest to late fall and early winter, exotic wildlife from other parts of the world, particularly Africa and Asia, have been introduced over much of the Hill Country to provide year-around hunting income. By law, native deer are considered property of the state until they are brought down. Exotics, however, belong to the landowner. Exotics have not been without their problems. Some are highly competitive with native deer and can starve them out if not controlled. This has caused second thoughts among some ranchmen who have experienced a decline in native populations as their exotics increased. Today a trophy whitetail buck will bring a higher premium from hunters than most exotics. The law of unintended consequences sometimes comes into play. In the 1920s a landowner near San Antonio imported Russian boars for sport hunting. Some escaped, and today these wild hogs have become a menace to calves, lambs and kid goats in many Hill Country counties. Exotic wildlife do not necessarily remain where their owners put them. Many ranchers who originally invested significant sums to acquire them have seen them migrate to neighboring ranches whether they are wanted there or not. Double-high fences have been built in an effort to contain these exotics, as well as to allow at least some selection in the breeding of native whitetails to produce better antlers and greater body size. However, an undesirable side effect can be intensified grazing and browsing competition by the exotics to the detriment of fenced-in natives. It has been said, with more than a little justification, that the cowboy’s life changed relatively little from early ranching days after the Civil War to the outbreak of World War II. He no longer worked on the open range, of course, but within the perimeters of a ranch’s fences, and he might go to town in a car instead of on horseback. But on larger ranches he still spent a major part of the year out with a chuckwagon, sleeping on the ground, taking his meals from a line of Dutch ovens after a cook prepared them over hot coals or an open fire. Though the boss in town might have electric lights, the ranch probably did not. The cowboy’s method of working cattle was inherited from his open-range grandfather, who in turn had probably learned it from Mexican vaqueros. His wages had not improved much since trail-driving days. World War II and its manpower shortages forced drastic changes upon the ranching scene. Much of the workforce went into military service. Ranchers had to streamline operations for efficiency, automating wherever possible, cutting pasture sizes, substituting machinery for manual labor, pickup trucks for horses. Most of these changes became permanent, for much of the pre-war manpower never returned. Former cowboys found higher paying jobs in the oil fields and in town. Many innovations appeared in the first decades after the war: crossbreeding, artificial insemination and computerization being only a few. A seven-year drought in the 1950s drove home severe lessons in range management, bringing a greater awareness of proper stocking rates, encouraging rotation grazing, grass reseeding, new methods of brush control. Ranchers today tend to know more about conservation than their forebears, calling upon the accumulated experience of past generations as well as their own. Cattle near a windmill in Hutchinson County. Photo by Robert Plocheck. Water is by all odds Texas’ greatest long-range problem. Ranching has far less impact upon the state’s water supply than do irrigation farming and many types of heavy industry. By and large, livestock’s water needs are met by relatively shallow wells, mostly serviced by windmills or small submergible pumps. Their drain on groundwater supplies is minimal. However, ranchers can be affected by both surface and underground pollution, usually coming from outside sources such as oil fields, mining or chemical runoff from cultivated fields. The condition of the range affects both quality and quantity of runoff water that finds its way into rivers, streams and reservoirs. A relatively new development in certain areas is landowner sale of water rights to towns, cities and industry, which critics see as having a potential to drain underground reservoirs and leave future generations without sufficient water. They point to experience with the great Ogallala aquifer, which underlies much of the Panhandle. It has been reduced markedly over the last 50 years, largely by irrigation and municipal pumping at levels far exceeding the modest natural recharge rate. Further shrinking of the water table could force irrigation farmers back to dryland operations and leave ranchers without water for their livestock. Wind has been a constant part of the Texas environment, especially in the western part of the state including the Panhandle. Early plains cattleman Charles Goodnight once remarked that wind became such a part of daily life that he noticed it only when it stopped. A few ranch owners have found a way to cash in on the wind in today’s search for alternative sources of energy. Vast windmill “farms” have sprung up on rangelands in such wind-swept locales as Rankin, McCamey and Big Spring, generating electricity from this one element of the Texas environment that seems inexhaustible. From an economic standpoint, ranching is no longer as large a segment of the state’s economy as it once was. Texas today is regarded as being urban. In terms of population, that is true. Most Texans today live in one of several major urban areas. Yet, all of those areas if lumped together in a single mass would barely cover Presidio County in the Big Bend. The rest of this vast state remains rural, a major part of it privately owned rangeland. The future of the Texas environment will be influenced heavily by what happens on that land. — the late Elmer Kelton of San Angelo was an award-winning Western author, who grew up on a ranch in Crane County and worked for many years as a farm and ranch writer and editor. 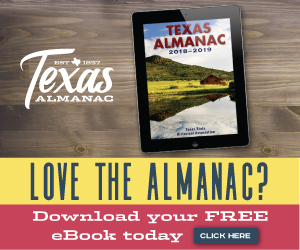 This article was written for the Texas Almanac 2006–2007. • Dary, David, Cowboy Culture, a Saga of Five Centuries, Alfred A. Knopf, New York, 1981. • Dobie, J. Frank, Cow People, Little Brown & Co., Boston, 1964. • Dobie, J. Frank, The Longhorns, Little Brown & Co., Boston, 1941. • Haley, J. Evetts, Charles Goodnight, Cowman and Plainsman, University of Oklahoma Press, Norman, 1936. • Jackson, Jack, Los Mesteños, Spanish Ranching in Texas, 1721–1821, Texas A&M University Press, College Station, 1986. • Lea, Tom, The King Ranch, The Hundred Year Story of the Greatest Ranch in the World, Little Brown & Co., Boston, 1957. • Wellman, Paul I., The Trampling Herd, The Story of the Cattle Range in America, Doubleday, New York, 1939. • Wilhelm, Steve, Cavalcade of Hooves and Horns, The Naylor Co., San Antonio, 1958.